'Bedouin Child' OGB+ (Herb McKusick, R. 1973). AB, 20" (51 cm). Early bloom. 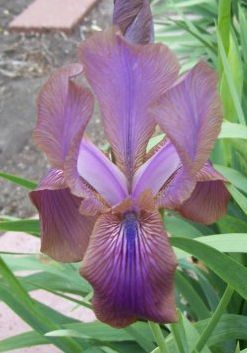 Standards red brown with some stolonifera markings, but lighter; Falls same, overall color is richer and darker than stolonifera; metallic blue beard. I. stolonifera x unknown C. G. White oncogelia-bred. Aril Society, 1974.